There's nothing new about nostalgia. Furniture designers often reference, get inspired by, or plain steal ideas, from previous periods. This tendency was particularly strong during the 19th century, which saw wave after wave of Revival styles, as furniture makers systematically pillaged the past for ideas. Often, their interpretations had only a vague resemblance to pieces of the actual period - but then, their clients wanted smart furniture, not a history lesson. Since Revival styles overlapped to a great degree, both in terms of when they were in vogue and the design elements they used, authorities often disagree on the precise dates that each style flourished. The following time periods reflect a consensus as to eras. Antiquity was already a popular influence in furniture around the turn of the 19th century. But Napoleon Bonaparte's conquests in Egypt sparked a mania for motifs and silhouettes that specifically reflected the civilization of the Nile: pharaohs, barges, sphinxes. Egyptiennerie, as the French called it, is a component of the overall Empire style (named for Emperor Napoleon's reign). Along with Egypt, Empire furniture plundered styles (monopodium tables, klismos chairs) and motifs (lyres, caryatids) from ancient Greece and Rome. While the Empire period lasted throughout much of the first half of the 19th century, the term Greek Revival—also known as Classicism—often refers more specifically towards the end of this period, when the furniture became heavier and less ornate—the antique influence more in the overall shape than in decoration or motifs. Furniture of the Rococo Revival period hearkened back to the mid-18th century and the reign of Louis XV. 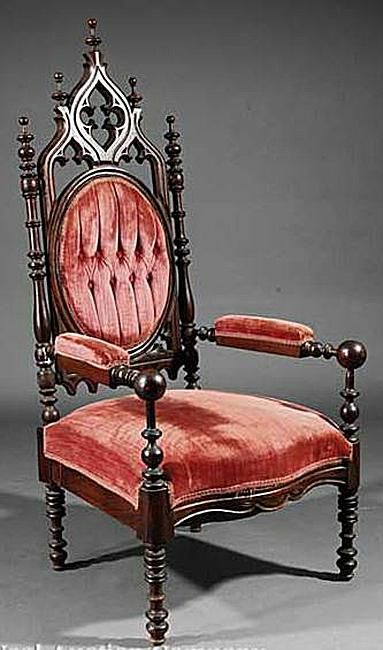 Made of walnut, mahogany, or rosewood, tables, chairs and sofas have cabriole legs and often feature naturalistic carvings of fruit, flowers, and leaves. Curvaceous shapes ruled: the fronts of dressers are often serpentine-shaped and the corners are rounded; leaf or fruit carved pulls decorate the drawers. The cabinetmaker who put Rococo Revival on the map was John Henry Belter, a New York manufacturer who used a technique of laminating the wood—usually rosewood—and then forming it into the scrolls and curves so beloved by 18th century French designers—though they might have found his lavish use of them a bit de trop. Attributes of the Renaissance Revival style are turned and fluted legs, raised, or inset burled panels, heavily carved finials and crests, inset marble tops, and cookie-cut corners. Many pieces are further decorated by black and gold incising, marquetry inlay and bronze or brass mounts. These pieces were often gargantuan—ideal for the Victorian "more is more" philosophy. The preferred wood was walnut, as it had been in the 1500s—and that was the most accurate thing about this revival style, which also borrowed heavily from the 17th-century Baroque and the earlier Gothic periods. Running parallel with the Renaissance Revival style (and containing many of the same elements, confusingly) was Gothic Revival. Pointed tops, spiky pilasters, arches, and rosette motifs tended to distinguish the style— even if these elements originally decorated medieval cathedrals rather than furniture.